The Cricout iPhone App is Here! Cricout has been in the making for some time now. This year has been big for the website, which provides users an integrated platform to follow live cricket in a social networking environment. Since the website's launch earlier this year, Cricout has provided online followers of the game an alternative online source to follow live ball-by-ball commentary of cricket matches being played around the world. A social networking environment where you can interact and share news, pictures, and videos with your friends. Cricket experts, who provide their expert views on live cricket matches, who you can follow. Newsfeed that provides all the latest cricket news, posts by your friends, and posts by the cricket experts that you follow. 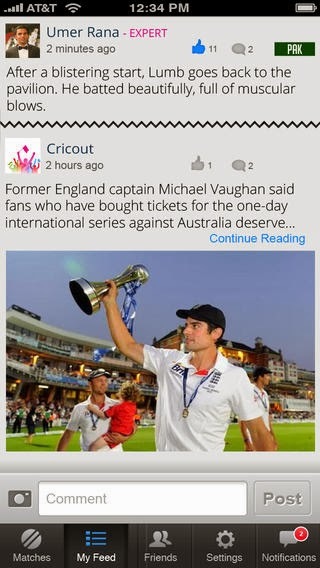 As the website continues to grow, Cricout has released its iPhone application, which is now available on app store. You can download the app from here. Cricout is a whole new social experience of following cricket online, and the new iPhone app allows you to do that on the go! It is your one stop destination for live ball-by-ball commentary, expert comments, social interaction with friends and cricket experts, and your daily dose of cricket news delivered in a personalized feed. Cricout is the new age of live ball-by-ball commentary and a must use for all online followers of the game.